Roxrite stands onstage in Moscow, covered in Champagne, having just won the world championship of breakdancing, the Red Bull BC One. Surrounded by thousands of breaking fans, Roxrite shouts out his hometown b-boy crews SUB-4 from Windsor and Renegades from San Francisco, and on a world stage, between breaths: "I finally got to accomplish a dream, it's a blessing. Much respect 415 and 707, Sonoma County!" Three months later, Omar "Roxrite" Delgado is fresh off an airplane from Rio de Janeiro, taking a few days to unwind before leaving for an Adidas Originals breaking contest in Poland. Hailing from Windsor, the 29-year-old has catalogued trips to 37 countries, winning more than 70 championship titles all over the world. Between video shoots with Red Bull, judging international competitions, and filming the TV series Break'n Reality, out this spring (watch the trailer), Roxrite is a local b-boy making good—and finally getting paid for paying his dues. From the very beginning, the b-boy has been one of the four elements of hip-hop culture, together with the DJ, the MC and the graffiti artist. Their combined disciplines form the source of a uniquely American experience. In the early 1980s, the boroughs of New York City produced the elements in which breakdancing became immortalized in movies like Beat Street and Breakin'. It was a time when Adidas stripes and boom boxes lined every corner. Calling themselves break-boys, after the drum-heavy breakbeats that make up classic hip-hop, the abbreviated "b-boys" embody the hip-hop lifestyle through a highly technical and infinitely original form of dance called breaking. The chronicles of Sonoma County b-boys go back nearly as far as the Reagan administration and Ms. Pac-Man. Many of the old-school pioneers started dancing in junior high and have grown up to become guardians of hip-hop history. As in every culture, the most notable participants build up the group as a whole; it's those pioneers who keep the movement thriving for the youth to discover and develop. Before heading off to claim victory in Russia last November (see video here), Roxrite came through Sonoma County to visit family. "The trip reminded me of where I'm from and what I represent," he says. "It gave me that fire." Born in Mexico and raised in Windsor, Roxrite's story is like that of so many other immigrants. Yet he is also a bona fide example of the promise of the American dream; it was through perseverance and devotion to his craft that he earned the 2011 B-Boy of the Year and world champion titles. On the resurgence of the b-boy culture, Roxrite speaks from the heart. "When I hear more kids are doing it, it makes me smile. It's such an important part of true hip-hop," he says. "It provides an outlet to make something out of yourself. I wanna see more b-boys from the 707 step it up—I don't want to be the only one. Anything is possible; I came out of here." Every champion has had a mentor to guide him along the path of discovery and maturity. Yoda once said to Luke Skywalker: "Always two there are, no more, no less—a master and an apprentice." Becoming a world-class breaker requires a relationship no less profound. In 1984, when Beat Street and Breakin' were in theaters, there was Sha-One. 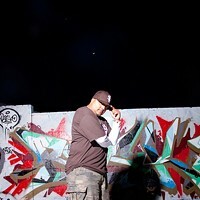 Considered by many a seed in the cultivation of hip-hop, Shen-na "Sha-One" Smith was one of the first to pass down the knowledge that has fostered an entire culture in the North Bay. "Sha-One is the oracle," says Man-E, a local disciple of hip-hop. "He's the one who gave us our fat laces and told us Kangols need to be tilted to the side." 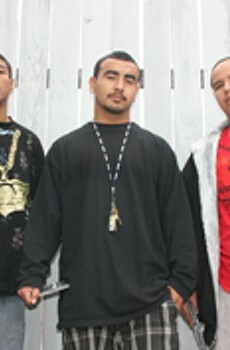 A respected mentor, Sha-One found his apprentice in Mike "Ground Level" Cisneros of Santa Rosa. "Sha-One blessed me with my name when I started SUB-4. 'Ground Level' means the foundation, and everything that is built comes from the foundation," he says. Beneath a trunk gold chain, Ground Level's classic b-boy style is reminiscent of an iconic graffiti-art character. SUB-4 has become one of the most significant b-boy crews in Sonoma County history. 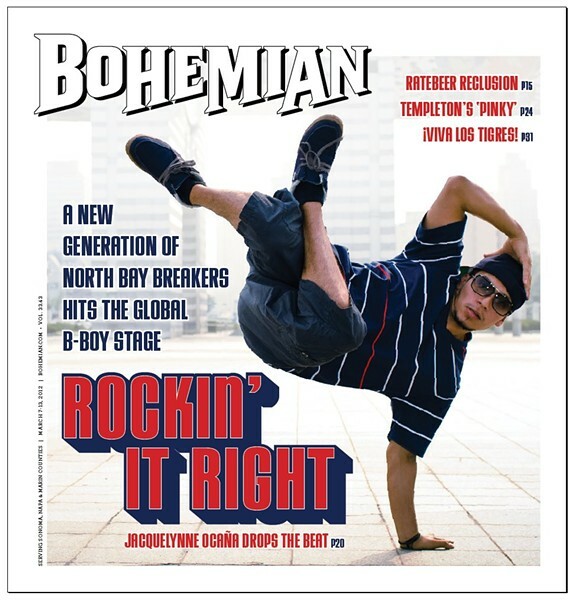 Standing for "Straight Up B-Boys-4 Elements," its name gives a nod to the importance of the DJ, the MC and the graffiti artist within b-boy culture. Assembled in 1994 on the linoleum floors of the Danger Room at Windsor's first community center, SUB-4 was adamant about dedicated practice times while forbidding drugs and alcohol. During an era of heavy gang activity, dancing was a positive outlet in an otherwise rough environment. At one of SUB-4's signature events, called Hip Hop on Stage, a 13-year-old Roxrite suddenly appeared out of the crowd to battle another b-boy, and outright rocked the show. Promptly inducted into the crew, Roxrite trained rigorously under the already experienced Ground Level. "One day we were at the Danger Room, and I said, 'You know what? I'm going to name you Roxrite, because you are doing it the way it's supposed to be done," says Ground Level. Ground Level attributes Roxrite's inevitable rise to b-boy fame through SUB-4's commitment to daily practice, countless trips to competitions all over the country and living a life dedicated to the dance. "I don't think a person like Roxrite can exist on thinking he was going to get prizes," he says. "A person who does that does it for the passion."